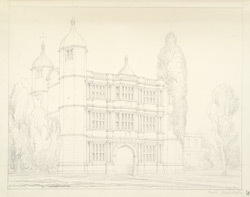 This drawing is of Tixall Gatehouse, the only surviving portion of Tixall Hall in Staffordshire. Tixall Hall was originally built by Edward Aston in 1555. His son, Sir Walter Aston, was responsible for adding the 50ft high gatehouse in 1580. The gatehouse remains as an outstanding example of Elizabethan stone architecture. The styles of ancient Greece and Rome was fashionable in England at that time, and on each story of the gatehouse there can be found the Doric, Ionic and Corinthian orders. The Aston family were Protestants, and Tixall was used to detain Mary, Queen of Scots in 1586. Although the hall faced major rebuilding work in the 18th century it was eventually demolished in 1928.